Are you afraid of getting penalised by Google? Well, we are in the same boat. Google clearly defines its goal which is to provide the best possible search experience for the users. In order to accomplish that, Google is continuously updating its algorithm to rank the most relevant websites, penalise poor quality website, check for content duplicates and more to provide better results to the users. Over the past few years, Google release major updates on the algorithm of Google Panda, Google Penguin, Google Hummingbird and Google Mobile Friendly Update & Mobilegeddon. These changes have penalised numerous websites while some of them lost their readers and business. Therefore to stop being frightened by Google Penalty, you should know how to adhere with its Google Webmaster Guidelines before developing a website or running SEO campaigns.Outlined below are tips you can use to avoid getting penalised however there is no certain method to completely steer clear of Google’s algorithm. 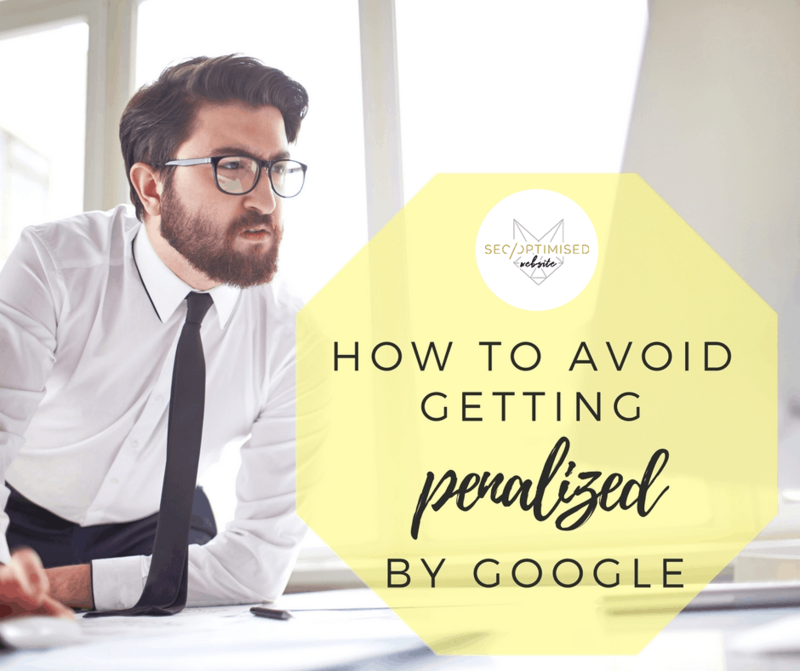 The following tips are aligned with Google’s advice and recommendations which you need to understand and follow to avoid a Google penalty. You should feel fine after applying these best practices. Create rich and relevant content. Content is a core key to drive traffic to your website because this might contain the information users are looking for in the internet. It can also help you get higher SEO ranking and good quality organic backlinks. The internet is swamped, with websites being published every day offering niche contents. However Google can only rank 10 of the most relevant websites to its first page results. If you intend to be among these websites, you need to create lengthy, rich, relevant, helpful and comprehensive contents. The notorious Google Panda and Penguin are made specifically to target poor quality and spammy backlinks also known as Link Farming. It is a technique used to create backlinks for the sake of getting higher page ranking on search engines. They are not genuine links included on a black hat SEO approach used to trick search engines which has been prohibited by Google for many years. To avoid getting penalised by Google, focus on generating high quality and natural links. You can submit your website to a directory listing like Yelp, Manta, Google My Business, Bing Places for Business and Yahoo Business Listing. These reputable websites may allow you to put a link back to your website and maximise your online exposure. Focus on generating relevant links. It is paramount to have domains linking to your website but make sure they are relevant to your niche. Whilst pagerank is the most important factor of link building, Google is now focusing on relevancy. Content and website relevance are often the top criteria when Google ranks a website depending on the user’s search phrases. To do this right, you should generate backlinks from relevant websites. Ask yourself “is this domain related to my niche? For example, a SEO Agency website should not generate backlinks from a pet salon website. In fact, a website with 100% relevant backlinks is safe from being penalised by Google. Avoid fake social media signals. Do not fake social media signals, websites with fake Facebook and Twitter followers are prone to Google penalty. A social media page with 50,000 followers but only has 2 post and 0 shares, uses a general image for the profile picture and provides no complete information may indicate a fake account. With the fake social media signals your website is receiving, you have a huge chance of getting penalised and will not have the opportunity to rank on Google. Use a variety of anchor texts. It is important to use a variety of phrases and keywords as your content’s anchor text to avoid Google penalty but many website owners and bloggers tend to forget this important rule. Anchor text should come in various forms and do not rely on the generic ones like click here, read more, etc. Ideally your anchor texts can be based on your brand, your complete website URL, domain name without the http://www, company name, and variations of keywords you want to rank for. Although this can help you make content that’s natural and appears human to readers, it is still important to know the right density for these anchor texts. The truth is, avoiding Google penalty is a difficult task and seems very laborious but if you follow the Google webmaster guidelines, these tips and perform just white hat SEO, your ranking should be fine. A lot of websites are penalised due to link-farming, irrelevant backlinks and low quality content so pay close attention to those aspects. SEO dynamically changes over time and it’s important to stay tune for more updates. Best of luck on your SEO campaign and hopefully Google will not penalise your website.